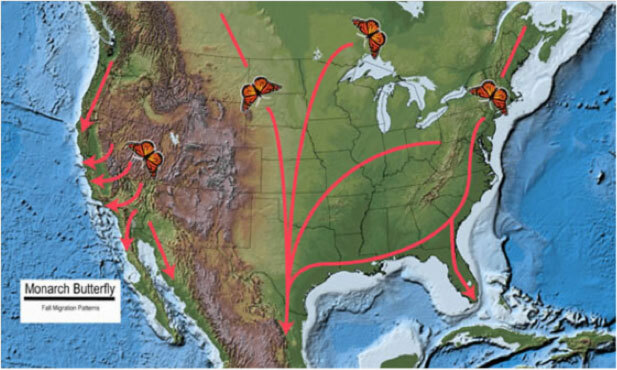 Similar to many species of birds, Monarch butterflies perform a North-South migration pattern between Canada and Mexico. Monarch butterflies have the longest migration of all other butterflies as they can journey up to 3,000 miles. These butterflies are thought to use air currents and thermals to help carry them along their way during their migration. Theories of how Monarchs navigate north and south during the year include using the position of the sun and the magnetic pull of the earth. 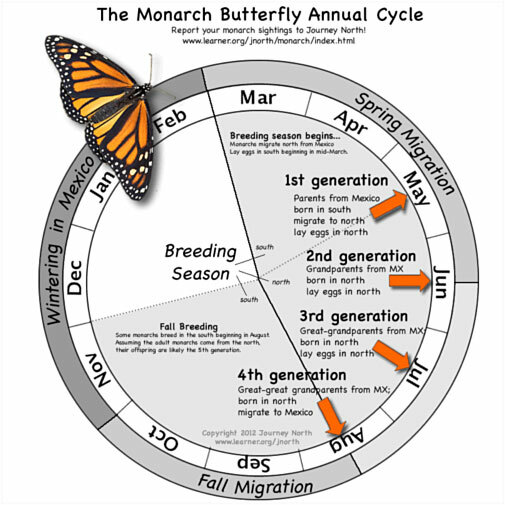 Monarch butterflies have a unique migration process where multiple generations of Monarchs are used to complete the migration north during the warmer months (Figure 1) and one generation to complete the migration south during fall and winter (Figure 2). Monarch butterflies from the North Central and North Eastern parts of the United States migrate to and reside in Mexico for the winter months (also known as “overwintering”). Monarchs from the North West migrate to coastal and southern California and overwinter there until the spring. Monarchs that overwinter in the Sierra Madre Mountains of Mexico take refuge in the Oyamel fir forests where they can take shelter and keep warm during the night. These forests create what is called a micro climate where the temperature never dips below freezing or exceeds 60 degrees Fahrenheit. Monarchs need this during the winter to ensure their survival come spring. Figure 2. Monarch Butterfly Fall Migration Patterns. Monarch butterflies that overwinter in Mexico begin their journey north starting in the spring of each year (February-March) with one of their first stopping points occurring throughout Texas. Here, breeding and reproduction begins (Figure 3). Monarchs will have about four generations during the summer months along their journey north with each generation navigating further and further north until they reach their final destination. The last group of Monarchs that are hatched before fall go into a state of reproductive diapause where their breeding will stop. This is the generation of Monarchs that will make it all the way down to Mexico for the winter, wait out winter and then begin the breeding cycle again in the spring in northern Mexico or Texas. This group of Monarchs is also called the ‘super generation’. The lifespan of a Monarch butterfly during the reproduction period is about 2-3 weeks. 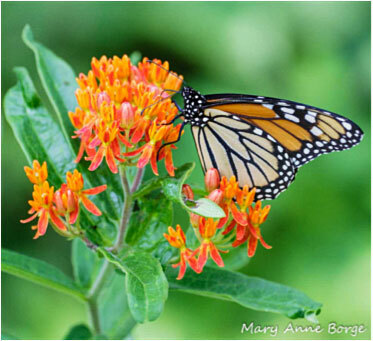 Monarch butterflies depend on a plant called Milkweed (Figure 4) during their reproductive journey. The presence of this plant is extremely important to their reproductive and migratory success. About 40 species of milkweed has been reported in Texas with about 11 species in Midland County of Midland, Texas (www.sibleynaturecenter.org). Milkweed is what is called a ‘host plant’ for Monarchs since it is the only plant where Monarch butterflies will lay their eggs. In addition, when the larvae of the Monarch butterfly feed on the milkweed, they ingest the toxins that milkweed contains thus becoming toxic to predators themselves in both the larval and adult stages. The common milkweed is one of the most popular milkweeds used by Monarchs across the nation (Figure 5). Monarchs require four main things for a successful migration and their survival as a population including: Milkweed (food for larvae), nectar (food for adults), shelter and water. Any alteration to the availability of these items can result in a decrease in their population. Drought, disease, pesticides and field clearing are largely responsible for the decrease in both milkweed and nectar plants. Birds such as the black-headed grosbeak and black-backed oriole have a resistance to the Monarch’s toxin, so they can actively feed on both the adult and larval stages. In addition, Illegal logging in Mexico results in the decline of Oyamel forests which Monarchs depend on for shelter in during winter. Figure 4. Monarch on "Butterfly Milkweed"(Asclepias tuberosa) can be found in southern Texas. Report your sightings at http://www.learner.org/jnorth/tm/monarch/SpringWatch.html. This will help researchers and conservationists keep track of Monarchs in your local area and around the nation. Plant native milkweed and nectar plants in your area or garden to allow places for Monarchs to lay eggs, feed and rest. Prevent blindly spraying pesticides along your property in case you have milkweed plants growing. Donate to local groups in your area to help them in conserving this amazing population of butterflies. Avoid buying products sourced from Oyamel forests in Mexico to help prevent the logging of the Monarchs overwintering habitat.